Coming closer to Jesus is certainly what happened with the former Protestant ministers whose conversion stories are featured below. A common thread throughout their stories is that at some point in their careers or education they were compelled to study the early Church Fathers – i.e. those who led the Christian Church in the first several centuries after the apostles died. Church Fathers include Ignatius of Antioch (d. A.D. 110), Clement of Rome (d. 97), Polycarp (d. 155), Justin Martyr, Irenaeus (d. 202), and Cyprian (d. 258). An in-depth study of the New Testament can additionally prompt a person to embrace Catholicism. Usually the decision boils down to coming to appreciate the importance of the Eucharist and the real presence of Christ within the Eucharist. Probably the most well-known former Protestant minister turned Catholic is Dr. Scott Hahn. He’s is a prolific author and prominent speaker on the Catholic lecture circuit. Currently a professor of Biblical theology at the Franciscan University of Steubenville Ohio, he’s a former Presbyterian minister and was a militant opponent of the Catholic Church. He converted to the Catholic faith in 1986. 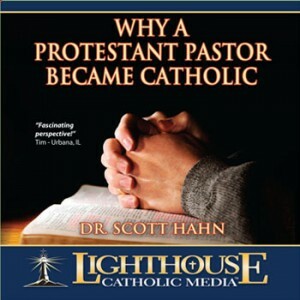 His powerful conversion testimony is the most widely distributed Catholic audio recording of all time, “Why a Protestant Pastor Became Catholic”. Hahn is a scholar on the Bible and early Christianity, able to read the original texts in ancient Hebrew and Greek. While at Presbyterian seminary, that helped enable him to delve deep into the literature of that time period. As a Protestant he was of the school of thought that a person is saved by faith alone rather than by both faith and good works. Sola fide – faith alone – and sola scriptura – the Bible alone – were the battle cries of the Protestant Reformation. Luther based sola fide on a passage in Romans 3:28, which to him indicated that faith is all you need for salvation. Luther’s German translation stated that man is justified by faith alone. But while reading the book of Romans in the original Greek, Hahn saw that something was missing in the Greek – the word “alone”. It said men are justified by faith, but not by faith alone. Nevertheless he put that out of mind and became a Presbyterian minister in the Washington, D.C. area. He began to share with his parish all that he had been discovering in his studies in college and seminary. He started to understand and appreciate the concept of covenant, and noted that Jesus only used the word covenant on one occasion, when he instituted the Eucharist. So Hahn’s church started having the Eucharist along with the sermons. Then he started teaching a course on the Gospel of John, and got stumped when it came to John 6 verse 53. Jesus said, “Truly truly I say to you unless you eat the flesh of the Son of Man and drink his blood you have no life in you.” He and his fellow Presbyterians had been taking that figuratively. It doesn’t mean it’s literally his flesh and blood, Hahn had always thought. But as he read the Greek texts, he discovered that Jesus nowhere indicates that it was just a figure of speech. Four times Jesus says to a crowd, eat my flesh and drink my blood. Most of the crowd left – except for the 12 apostles – because that concept was so difficult to accept. Had Jesus just considered it a symbol, Hahn recounts, he would have said so and called them back. But he didn’t. That prompted Hahn to realize that it’s more than the Lord’s Supper, it’s the Eucharist. It’s more than a symbol, it’s reality. It’s more than a figure of speech – Jesus really expects people to eat his flesh and drink his blood. After some time Hahn began attending mass, just as an observer. He couldn’t believe how much of the Bible he was hearing – three readings of Scripture. Then during the liturgy of the Eucharist he heard for the first time in his life the words of consecration, “This is my body.” And when the priest elevated the consecrated host, he felt the last drops of doubt draining out of his heart. Said he, “I felt like an orphan who finally found my way home”. 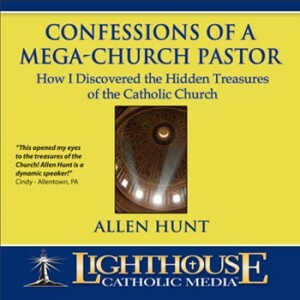 Allen Hunt, author of Confessions of a Mega-Church Pastor, once led one of the largest Methodist churches in the world, serving more than 15,000 people each week. After finishing seminary at Emory University, he got into the PhD program at Yale University on New Testament early Christian history. At the end of a lecture during Q&A, he got into an exchange with a particular nun there. She asked him why he wasn’t part of the Catholic Church. He said the main reason was communion. It’s a symbol, he said. A metaphor. But the sister wasn’t done yet. They had just got done studying first Corinthians where Paul passed on what he received from the disciples, who received from Jesus that this is his body, this is his blood. He doesn’t say this is like my body. He doesn’t say this is like my blood. He says plainly this is my body, this is my blood. While still a non-Catholic, during his vacations, Hunt started attending Catholic masses. He explained that had he attended a Protestant worship service inside an unfamiliar church in an unfamiliar town, he wasn’t sure whether it would be a good service. He didn’t want to waste a Sunday. By going to a Catholic church, he knew what he was going to get. He’d get the liturgy, focused on the altar – which has been the same for 2,000 years. It would be exactly the same no matter where he goes in the world, even if he doesn’t understand a single word. Deacon Alex Jones was an African-American Pentecostal minister in Detroit from 1975 to 2000, and is now an ordained permanent deacon in the archdiocese of Detroit. Not only did he convert to Catholicism, but he brought 54 members of his congregation with him into the Church, entering it on April 14, 2001. Jones’ journey started one Wednesday in 1998. Always wanting to be innovative and creative, that evening he asked his congregation, “Would you like a New Testament worship service?” He was seeking to give them most genuine experience of the early Christian Church. They said yes. He said give me 30 days to study up, and after that we’ll do it the way the early Christians did it. So he delved into the texts of the apostolic fathers. “In those 30 days of reading and searching,” recounted Jones, “my whole life was transformed.” He came face to face with the truth, says Jones, as he began to read the Church Fathers. He saw a different Christianity compared with what he was used to. The Church was liturgical. In other words they had a systematic way of worship that was uniform and universal. Great preaching wasn’t the center of the worship service back then. It was the Eucharist. Not only that, but they considered the Eucharist Christ’s real body and blood. Jones previously was under the mistaken impression that that concept arose duri ng the Middle Ages. He found that the early Church was not only liturgical, but also hierarchical – with bishops, presbyters and deacons. The bishop presided in the place of God and the presbyters did so in the place of the council of the apostles. “The most telling thing in my reading of the Fathers was that the whole spirit of the apostolic and post-apostolic Church was totally different from the Christianity that I saw around me,” he intoned. At Jones’ Pentecostal church, everybody wants to be blessed. Everybody wants to receive. Everybody wants God to do something for them. They want a new house, a car, a good job. But Jones didn’t see that in the apostolic church. He saw a desire to serve Christ to the point of giving up one’s life. He saw a dedication to holiness and to holy living. Many things that Jones previously believed he found not to be true, such as sola scriptura and rejection of tradition, discussed above. 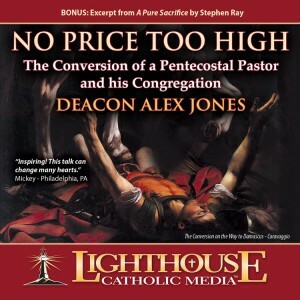 What mainly prompted Jones to join the Catholic Church were two truths. Number one was the Mathew 16:18 passage when Jesus says, “You are Peter, and upon this rock I will build my church; and the gates of Hell will not prevail against it.” He was giving the church perpetuity. Number two was when the Holy Spirit, post-resurrection, breathed on the apostles as they gathered in the upper room, leading and guiding them into truth. That told Jones that the Church that the Lord initiated in the upper room would never become corrupted and that the Holy Spirit will be with it forever. There’s a clear line from what happened in the upper room to the present, and that line is manifested in the Catholic Church. “It seems the Holy Spirit branded that into my mind and heart,” thundered Jones. He contrasted that with his own church, which began in 1982. Where was his and the thousands of other Protestant churches before the 16th century?, he asked. His conversion cost him much, such as many friends and brothers with whom he had walked for the previous 40 years. But he thanks God that he’s home at last. 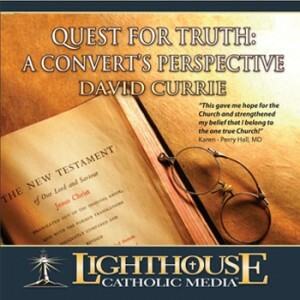 David Currie was raised in a devout Protestant family, his father a fundamentalist preacher. Growing up, he had never wanted to be anything other than a fundamentalist preacher. He studied in the Masters of Divinity program at Trinity Evangelical Divinity School, but after a long and arduous journey Currie entered the Catholic Church with his family in 1995. While at seminary he started to make a mental list of Bible verses that had no answer or that were not understandable in any Protestant tradition. He says there are a lot of them, and they started to nag on him. He had no doubt that somewhere he would find the theological system that made the whole Bible makes sense – that took into account all of the verses of the Bible. He did find that but it was the very last place he ever expected: the Roman Catholic Church. Currie had gone through seminary without ever reading first-hand about the Church Fathers. He finally did that, and found that everybody who said anything about the Eucharist or about the mass for the first thousand years of the Church assumed the real presence of Christ in the Eucharist. The verse he couldn’t get around was John chapter 6 verse 51, where Jesus says, “I am the living bread that came down out of heaven; if anyone eats of this bread, he will live forever; and the bread also which I will give for the life of the world is my flesh.” He had always thought that Jesus was speaking in symbolic terms. But after studying the early Church Fathers he realized Jesus didn’t give us that option. Currie knew there was only one church that consistently and faithfully taught the meaning of that verse. He even spent a month trying to find one teaching of the Catholic Church that was verifiably the absolute antithesis to what Scripture taught, but he couldn’t find one. Currie had always believed in the Apostles Creed, but only after tremendous research and soul-searching became convinced that the Catholic Church is the church of which this Creed speaks. The more he studied the Bible, the more he found the truth in the Church. Currie and his wife became convinced that the Catholic Church really is the church that Jesus Christ founded 2,000 years ago, and for this reason he didn’t have any choice but to give it all of his loyalty and support. Additional reasons Protestants convert to Christianity include the realization that there needs to be a pope. Among other things, that’s based on Jesus telling Peter that upon him – Peter means Rock – he will build his Church and give Peter the keys to the kingdom. As Scott Hahn explains, Jesus was referring to the Old Testament book of Isaiah 22 verse 15 which says keys are the symbol of authority to the House of David – and the House of David is a reference to a dynasty that lives on with succeeding generations, with offices that become vacant and that need to be filled. That of course is reflected in the succession of popes after the death of Peter. The early Church did recognize the Bishop of Rome as having that supreme authority. William Jurgens’ The Faith of the Early Fathers examines the early fathers and the many things they said indicating recognition of this authority. The doctrine of papal infallibility is a favorite punching bag of Catholic naysayers, but Catholic converts come to see its necessity. Most Protestants readily accept the Bible as being infallible. Why would God stop there? Hahn explains that rejecting papal infallibility implies that once Jesus gave the Christian Church this infallible scripture, there was no need anymore for infallible interpretations of scripture. That’s like saying once the Founding Fathers gave us the U.S. Constitution, there was no need for any court of final appeal to interpret, enforce, explain and proclaim the truths therein. Confusion and disarray would prevail. That is why there are some 35,000 denominations of Protestantism today. 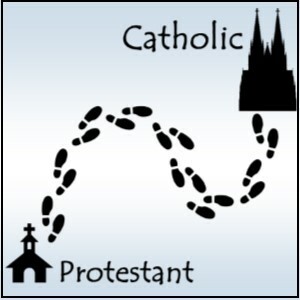 There are of course numerous other reasons why Protestants convert to Catholicism. 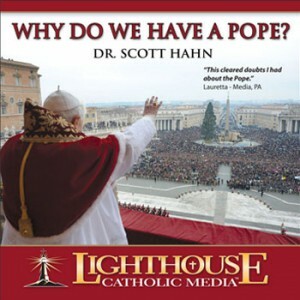 Good books on that subject include Scott Hahn’s Rome Sweet Home and Patrick Madrid’s Surprised by Truth, a three-book series in which the author recounts stories of dozens of converts to the faith. Listen to them. Your salvation could depend on it. Also click on graphics above.